Please fill out your name and email address below to sign up to the SFcrowsnest’s free science fiction and fantasy magazine. You will then be sent a confirmation e-mail with a link to click to make sure you’re not some dirty Klingon spammer. What is this strange magazine, then? SFcrowsnest sends out a FREE weekly magazine by e-mail. Each issue has reviews of the best new science fiction and fantasy novels, comics, TV shows and movies, as well as many features, interviews and editorials, not to mention breaking stories from the sci-fi, fantasy and horror genres. 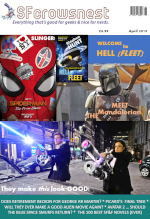 We cover everything from Lost in Space & the new Star Wars films, through TV like Walking Dead, The Expanse and Star Trek Discovery, to reviews of novels by Adrian Tchaikovsky, George RR Martin, James S. A. Corey, Stephen Hunt, Alastair Reynolds and thousands more best-selling authors. It’s just like those glossy sci-fi magazines you see sitting on the shelf of WH Smith and Borders – except you don’t have to pay $6.99 for each flipping copy each week! SFcrowsnest has been online since 1991 and is the oldest digital magazine dedicated to the science fiction, fantasy, horror genre (possibly the oldest online magazine of any ilk). Plenty of our current readers weren’t even born when the magazine launched. This makes us feel very old! Like the flipping Yoda of the genre. Some of our celebrity subscribers’ comments. Sean Pertwee – Actor: Gotham, Mutant Chronicles, Doomsday, Equilibrium, Dog Soldiers, The 4th Reich (as overheard at the Arthur C Clarke Awards, 28th April 2010). How do I white-list your newsletter to ensure delivery? Remember, you can unsubscribe from the free magazine at any point by clicking on the unsubscribe links at the bottom of each issue.